Our fire doors retainers are the safe and legal way to open fire doors open. These accessibility products are able to hold fire doors opens and automatically closing them in event of a fire. The Union Black DoorSense Fire Door Retainer is a standalone unit that can be fixed to fire doors in seconds. 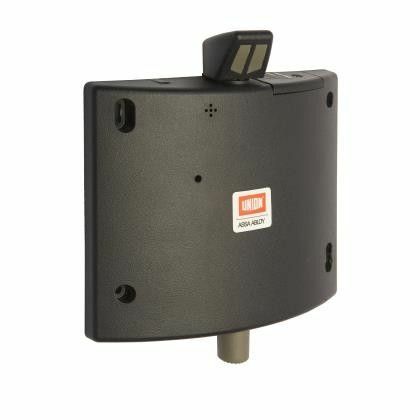 This fire door retainer can be released manually or automatically, by either the sound of the fire alarm or via a timer. Amongst our range of fire safety products, we also supply a variety of intumescent products in order to contain fire and smoke, helping to trap fire within the room of origin, prevent smoke from leaving affected areas and maintain the integrity of fire doors. Drop down seals will prevent smoke from passing under a fire door by tightly sealing the gap between the floor and door. Fire seals and smoke and fire seals are used to fill the gaps between the door frame and door leaf, preventing fire and smoke from passing through these openings. Door locks and door hinges can be protected and sealed with our intumescent door lock packs and intumescent hinge packs. Additionally, we stock intumescent letter plates and intumescent air grilles for further protection. Intumescent products will expand when exposed to extreme heat, thus being effective when protecting fire doors from fire damage. Ironmongery experts is proud to provide the very best in construction and joinery components. If you have any queries, feel free to visit our “contact” page.